"Power point" redirects here. For the quantity of Pokémon moves, see Power Points. For other uses, see Power point (disambiguation). Microsoft PowerPoint is a slide show presentation program developed by Microsoft. It was officially launched on May 22, 1990, as a part of the Microsoft Office suite. Originally designed for the Macintosh computer, the initial release was called "Presenter", developed by Dennis Austin and Thomas Rudkin of Forethought, Inc. In 1987, it was renamed to "PowerPoint" due to problems with trademarks, the idea for the name coming from Robert Gaskins. In August of the same year, Forethought was bought by Microsoft for $14 million USD ($29.1 million in present-day terms), and became Microsoft's Graphics Business Unit, which continued to develop the software further. PowerPoint was officially launched on May 22, 1990, the same day that Microsoft released Windows 3.0. PowerPoint introduced many new changes with the release of PowerPoint 97. Prior to PowerPoint 97, presentations were linear, always proceeding from one slide to the next. PowerPoint 97 incorporated the Visual Basic for Applications (VBA) language, underlying all macro generation in Office 97, which allowed users to invoke pre-defined transitions and effects in a non-linear movie-like style without having to learn programming. PowerPoint 2000 (and the rest of the Office 2000 suite) introduced a clipboard that could hold multiple objects at once. Another change was that the Office Assistant was changed to be less intrusive. PowerPoint 2002 massively overhauled the animation engine, allowing users to create more advanced and custom animations. As of 2012[update], various versions of PowerPoint claim ~95% of the presentation software market share, with installations on at least 1 billion computers. Among presenters world-wide, this program is used at an estimated frequency of 350 times per second. PowerPoint presentations consist of a number of individual pages or "slides". The "slide" analogy is a reference to the slide projector. A better analogy would be the "foils" (or transparencies/plastic sheets) that are shown with an overhead projector, although they are in decline now. Slides may contain text, graphics, sound, movies, and other objects, which may be arranged freely. The presentation can be printed, displayed live on a computer, or navigated through at the command of the presenter. For larger audiences the computer display is often projected using a video projector. Slides can also form the basis of webcasts. Entrance, emphasis, and exit of elements on a slide itself are controlled by what PowerPoint calls Custom Animations. Transitions, on the other hand, are movements between slides. These can be animated in a variety of ways. Custom animation can be used to create small story boards by animating pictures to enter, exit or move. PowerPoint provides numerous features that offer flexibility and the ability to create a professional presentation. One of the features provides the ability to create a presentation that includes music which plays throughout the entire presentation or sound effects for particular slides. In addition to the ability to add sound files, the presentation can be designed to run, like a movie, on its own. 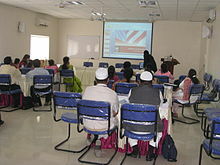 PowerPoint allows the user to record the slide show with narration and a laser pointer. The user may customize slide shows to show the slides in a different order than originally designed and to have slides appear multiple times. Microsoft also offers the ability to broadcast the presentation to specific users via a link and Windows Live. A PowerPoint presentation in progress. Supporters say that the ease of use of presentation software can save a lot of time for people who otherwise would have used other types of visual aid—hand-drawn or mechanically typeset slides, blackboards or whiteboards, or overhead projections. Ease of use also encourages those who otherwise would not have used visual aids, or would not have given a presentation at all, to make presentations. As PowerPoint's style, animation, and multimedia abilities have become more sophisticated, and as the application has generally made it easier to produce presentations (even to the point of having an "AutoContent Wizard" that was discontinued in PowerPoint 2007, suggesting a structure for a presentation), the difference in needs and desires of presenters and audiences has become more noticeable. Experienced PowerPoint designers point out that the "AutoContent Wizard" caused a glitch which contributed greatly to on-screen freezing of slides. Many designers opt to use the "blank slide layout" in lieu of the other layout choices for this reason. Nevertheless, in normal business use, most presentations created using PowerPoint are based on its default layout and font choices. The benefit of PowerPoint is continually debated, though most people believe that the benefit may be to present structural presentations to business workers, such as Raytheon Elcan does. Its use in classroom lectures has influenced investigations of PowerPoint's effects on student performance in comparison to lectures based on overhead projectors, traditional lectures, and online lectures. There are no compelling results to prove or disprove that PowerPoint is more effective for learner retention than traditional presentation methods. A "PowerPoint Ranger" is a military member who relies heavily on presentation software to the point of excess. Some junior officers spend the majority of their time preparing PowerPoint slides. Because of its usefulness for presenting mission briefings, it has become part of the culture of the military, but is regarded as a poor decision-making tool. As a result some generals, such as Brigadier-General Herbert McMaster, have banned the use of PowerPoint in their operations. In September 2010, Colonel Lawrence Sellin was fired from his post at the ISAF for publishing a piece critical of the over-dependence of military staffs on the presentation method and bloated bureaucracy. Musician David Byrne has been using PowerPoint as a medium for art for years, producing a book and DVD and showing at galleries his PowerPoint based artwork. The expressions "PowerPoint Art" or "pptArt" are used to define a contemporary Italian artistic movement which believes that the corporate world can be a unique and exceptional source of inspiration for the artist. 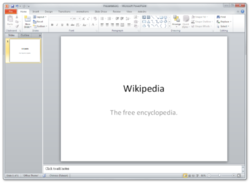 Microsoft Office PowerPoint Viewer is a program used to run presentations on computers that do not have PowerPoint installed. Office PowerPoint Viewer is added by default to the same disk or network location that contains one or more presentations packaged by using the Package for CD feature. PowerPoint Viewer is installed by default with a Microsoft Office 2003 installation for use with the Package for CD feature. 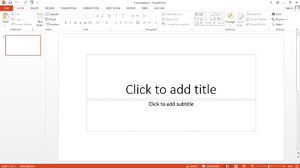 The PowerPoint Viewer file is also available for download from the Microsoft Office Online Web site. Presentations password-protected for opening or modifying can be opened by PowerPoint Viewer. The Package for CD feature allows packaging any password-protected file or setting a new password for all packaged presentations. PowerPoint Viewer prompts for a password if the file is open password-protected. 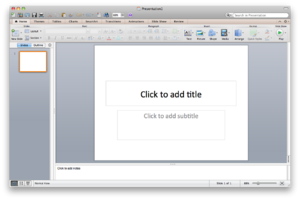 PowerPoint Viewer supports opening presentations created using PowerPoint 97 and later. In addition, it supports all file content except OLE objects and scripting. PowerPoint Viewer is currently only available for computers running on Microsoft Windows. Note: There is no PowerPoint version 5.0 or 6.0, because the Windows 95 version was launched with Word 7.0. All Office 95 products have OLE 2 capacity—moving data automatically from various programs—and PowerPoint 7.0 shows that it was contemporary with Word 7.0. Note 2: Version number 13 was skipped due to superstition. Note: There is no PowerPoint 5.0, 6.0 or 7.0 for Mac. There is no version 5.0 or 6.0 because the Windows 95 version was launched with Word 7. All of the Office 95 products have OLE 2 capacity—moving data automatically from various programs—and PowerPoint 7 shows that it was contemporary with Word 7. There was no version 7.0 made for Mac to coincide with either version 7.0 for Windows or PowerPoint 97. In PowerPoint 2011, several key features have been added. Screen Capturing allows for taking a screenshot and adding it into the document. It is now possible to remove image backgrounds, and there are additional special effects that can be used with pictures, such as 'Pencil effects'. Additional transitions are also available. However, the ability to apply certain text effects directly onto existing text, as seen in Microsoft Word is not available; a separate WordArt text box is still required. The binary format specification has been available from Microsoft on request, but since February 2008 the .ppt format specification can be freely downloaded. In Microsoft Office 2007 the binary file formats were replaced as the default format by the new XML based Office Open XML formats, which are published as an open standard. Nevertheless, they are not complete as there are binary blobs inside of the XML files, and several pieces of behaviour are not specified but refer to the observed behaviour of specific versions of Microsoft product. The Microsoft Office password protection is a security feature to protect Microsoft Office documents with a user provided password. ^ Lextrait, Vincent (January 2010). "The Programming Languages Beacon, v10.0". Retrieved 5 January 2010. ^ Austin, Dennis. "Beginning of PowerPoint: A Personal Technical Story". Retrieved 23 August 2014. ^ Gaskins, Robert (14 August 1984). "Sample Product Proposal: presentation graphics for overhead projection". Retrieved 19 August 2009. ^ Atkinson, Max (19 August 2009). "The problem with PowerPoint". BBC News. ^ Consumer Price Index (estimate) 1800–2014. Federal Reserve Bank of Minneapolis. Retrieved February 27, 2014. ^ Swartz, Luke (12 June 2003). "Why People Hate the Paperclip". ^ "Timeline – The animation engine in PowerPoint". ^ "PowerPoint Presentations: The Good, The Bad and The Ugly". Shkaminski. ^ Allan, Jones (18 August 2003). "The use and abuse of PowerPoint in Teaching and Learning in the Life Sciences: A Personal Overview". Bioscience Education. Retrieved 10 February 2009. ^ "The Use of PowerPoint in Teaching Comparative Politics". Technology Source. ^ "A quick introduction to great PowerPoint design". Pptpop. April 2014. ^ Themann, Tim. "Visual Logorrhea – On the Prevalence of Slideuments". Retrieved 23 August 2014. ^ Tufte, Edward (September 2003). "PowerPoint Is Evil – Power Corrupts. PowerPoint Corrupts Absolutely.". Wired (11.09). Condé Nast Digital. Retrieved April 15, 2014. ^ Savoy, April (30 January 2009). "Information retention from PowerPoint; and traditional lectures". Computers & Education. Retrieved 5 March 2009. ^ Bumiller, Elisabeth (April 26, 2010). "We Have Met the Enemy and He Is PowerPoint". The New York Times. Retrieved 27 April 2010. ^ Starbuck (July 2009). "The TX Hammes PowerPoint Challenge (Essay Contest)". Small Wars Journal. Retrieved 27 April 2010. ^ Hammes, T.X. (July 2009). "Essay: Dumb-dumb bullets". Armed Forces Journal. Retrieved 27 April 2010. ^ Sellin, Lawrence (September 5, 2010). "The PowerPoint rant that got a colonel fired". United Press International. Army Times. Retrieved 8 September 2010. ^ "PowerPoint Viewer". Download Center. Microsoft. 25 November 2011. Retrieved 6 July 2014. ^ "PowerPoint Tips". Bit Better. ^ "Do More on Your Mac". Microsoft. ^ "Microsoft Office Powerpoint 97 - 2007 Binary File Format Specification (*.ppt)". Microsoft Corporation. 2007. Lowenthal, P. R. (2009). Improving the Design of PowerPoint Presentations . In P. R. Lowenthal, D. Thomas, A. Thai, & B. Yuhnke, B. (Eds. ), The CU Online handbook. Teach differently: Create and collaborate (pp. 61–66). Raleigh, NC: Lulu Enterprises. Kalyuga, S., Chandler, P. & Sweller, J. (2004). When redundant on-screen text in multimedia technical instruction can interfere with learning. Human Factors, 46, 567-581. This page was last modified on 19 October 2014 at 06:02.